A project allows you to create, organize, and collaborate on related tasks. For example, if you wanted to organize liaison outreach with each academic department, you could create a project with a series of tasks assigned to different librarians. 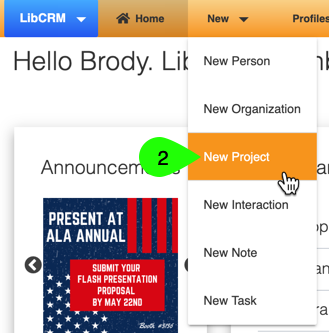 Each task could be associated with the respective faculty member's profile, allowing each librarian to easily log related interactions and notes along the way. As each librarian finishes their outreach with a particular department, they could mark the task as complete. Within a project, you can also upload notes and attachments, allowing you to easily share important documents, meeting minutes, etc., with your team. 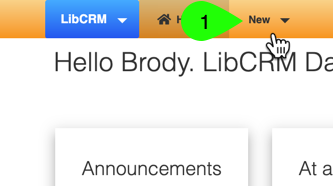 In the command bar, click on the New menu. From the dropdown, select New Project. Give your project a descriptive title. Optionally, you can specify a target start date and end date for the project. In the Brief Description field, you can add an optional overview or mission for the project. 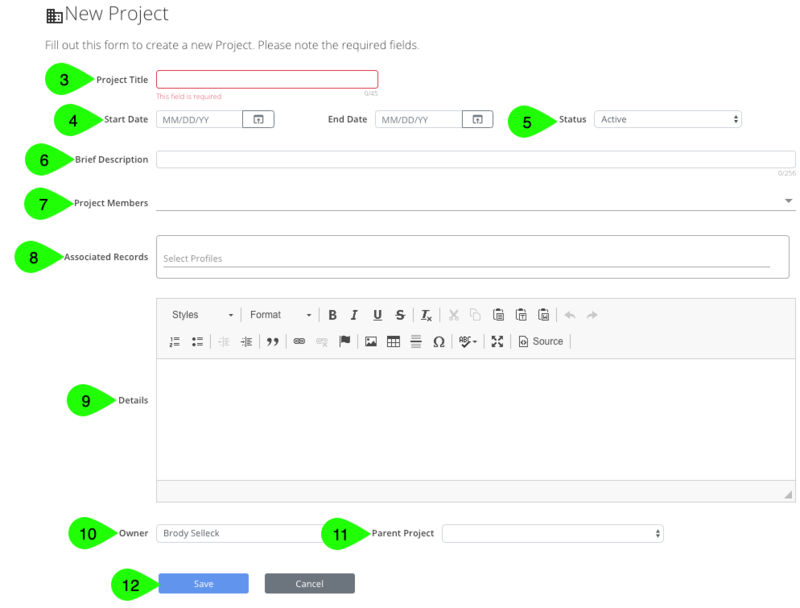 Use the Project Members field to select those users who are collaborating on this project. Use the Associated Records field to select those person or organization profiles associated with this project. Optionally, you can use the Details field to add a more detailed overview of the project, or other important info. By default, you will be listed as a project's owner when you create it. However, you can change this role to another user vai the Owner field. If this project is itself part of a larger project, you can actually designate its parent project. This can help you keep your related projects more organized. Click on assignment Projects in the command bar. Click on the New Project button. Follow Steps 3-12 in the above section to create your new project.